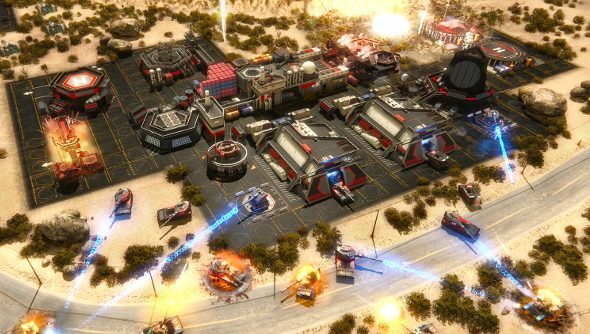 Act of Aggression, when compared to the dramatic, fanciful universes of StarCraft or Grey Goo, seems very understated, but Eugen systems’ grounded RTS fare has proved to be extremely compelling, and the source of many riveting battles, particularly those absurdly huge ones in the Wargame series. The latest Act of Aggression trailer spills the beans on the Chimera faction, a diverse, innovative army that relies on cash more than anything else. There’s good news, too, if you’re getting a bit impatient: launch is only a few months away. If you want to know how the Chimera differs from the other factions, here’s a quick primer, breaking down their specialities. The Cartel, stealthy operatives born out of private military contracts, with the latest prototypes. Fragile and expensive, but stealthy and powerful this secretive faction is difficult to master. The US Army: exhausted by endless fighting across the world, are brute-force veterans; they can skill up in specific roles and improve their veterancy, but use current generation technology. The Chimera: a UNO funded task force designed to have a plan in mind for every situation. You can mould their units through upgrades into specific roles, or leave them as a jack-of-all-trades. Act of Aggression is due out this September.